Coca-Cola has a creative way to entice you to download its mobile app: Stage an outdoor event with some popular dancers and upload the footage to YouTube. The soda giant makes this week’s Adweek/VidIQ top 10 branded video chart with a two-minute video promoting the Just Dance mobile app created as part of its partnership with Ubisoft. But instead of peddling the app with boring (and ineffective) banners, Coke set up a large crate at Paris’ Place St Lazare on Sept. 15. After a crowd formed, French dance team Les Twins performed the soda giant’s new "Find Your Move" song. 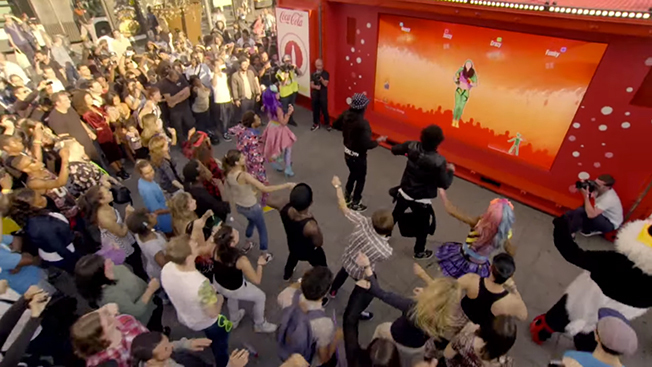 The Just Dance Now game is the second phase of Coca-Cola and Ubisoft’s partnership. In April, the brands launched the football-themed song "The World is Ours." Coke has rolled out special packaging for 25 million products with QR codes that consumers can scan to download the app, which unlocks more than 50 music tracks. Coke’s video was uploaded on Sept. 25 and has been watched 6.02 million times. It has also generated more than 2,000 Facebook shares and 267 tweets. GoPro’s Hero4 spot is the No. 1 video on the chart for the second week, showing the massive appetite that YouTubers have for interesting footage shot in unique ways. The camera brand’s video has been watched 10.5 million times, up from 5.65 million last week. Meanwhile, videos from Motorola Brazil have creeped onto the chart for the past few weeks, and now two spots claimed positions on this week’s chart. Neither of the 30-second videos are particularly innovative, but it’s a nice break from the Samsung versus Apple battle that typically dominates the electronics vertical. Check out the VidIQ-powered infographic below to watch all of this week’s top branded videos.